Dino puppet!, originally uploaded by Roy Janik. I just spent a few hours learning about and trying my hand at making puppets. 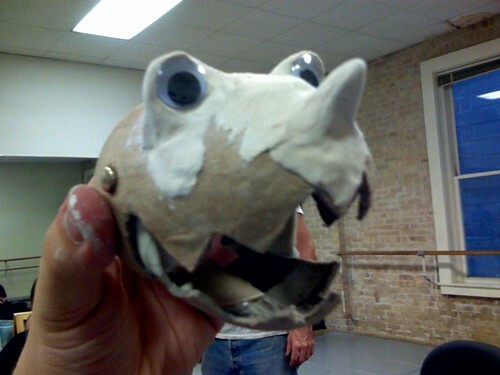 This is the crude, unfinished head of a dinosaur puppet. I was pretty happy that with no prior knowledge, I was able to at least sort of rig togeter and controllable, moveable mouth. So that's something. I love how my style of puppet directly corresponds to my style of doodling. Was this with Connor? That's awesome. Yeah, it was Connor. super helpful, nice guy... and he offered to help us more in the future.